Home and Away was rock solid again in the 700,000s with 741,000. Kim and Suong are the first team through to the My Kitchen Rules 2018 grand final after the mothers edged out brothers Josh and Nic with a specialty soup that judge Pete Evans called his dish of the competition. 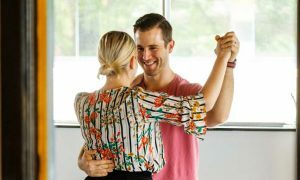 Teams had to prove they were worthy of a place in the grand final by serving a knockout three-course meal, with 90 minutes for entrée, an hour for main and a half hour for dessert. Judges Pete and Manu were joined by Colin Fassnidge and guest judges Karen Martini, Guy Grossi and Liz Egan to taste and score each team’s entire menu out of 10. The team with the lowest total score would be eliminated. The third last episode this season did 1.22m after 1.14m a week prior. 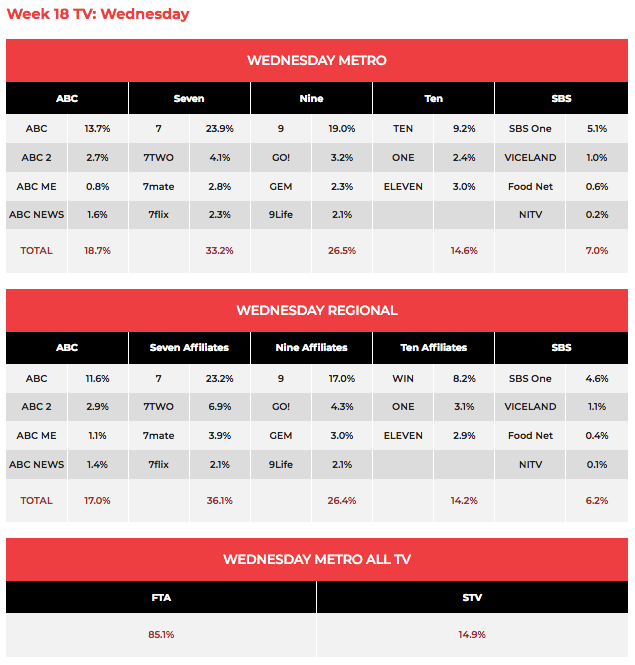 Modern Family has changed channels and the series started life on Seven with 577,000 after MKR. Back With The Ex was on later this week with 206,000, after 328,000 a week ago. Home energy costs and an Airbnb stoush featured on A Current Affair with 808,000 watching. US sitcoms Young Sheldon and The Big Bang Theory returned to the 7.30pm hour after a break from the schedule while The Voice blind auditions were under way. The comedies did 737,000 and 643,000 respectively. Nine then launched a new season of Britain’s Got Talent with 525,000 on debut. The series launched in the UK in mid-April. Special guests on The Project were Nick Giannopoulos and Mary Coustas in character as Jim and Effie. When asked what sparked their reunion, Effie said, “Cash.” The episode did 507,000 after 7pm. Another Royal Wedding doco on air last night was Meghan Markle: American Princess, which did 383,000 after 7.30pm. Graham Norton featured guests Orlando Bloom and Stephen Merchant with 240,000. Some of the channel’s tried and trusted brands returned last night with Home Delivery kicking off the entertainment at 8pm with multiplatform and multichannel star Julia Zemiro taking Rebecca Gibney home for the 609,000 viewers. 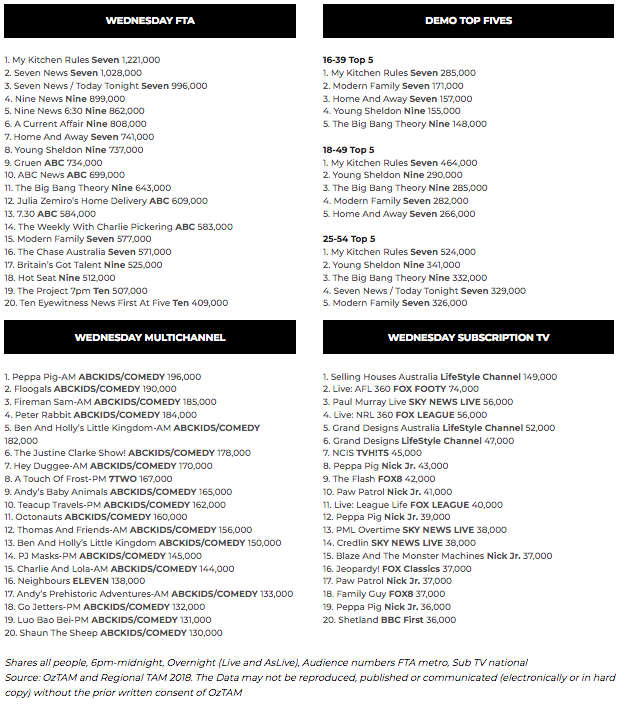 Gruen then returned at 8.30pm with what could be its lowest debut audience ever – 734,000. However, there is a growing audience watching on demand which doesn’t yet factor into these overnight numbers. 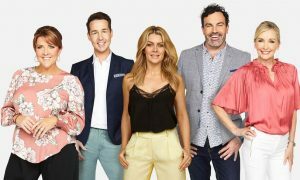 The first episode featured Leo Burnett’s Karen Ferry and Campaign Edge’s Dee Madigan joining host Wil Anderson and regulars Todd Sampson and Russel Howcroft. The Weekly then also returned with one of the highlights the Hard Copy interview with Em Rusciano. The episode did 583,000. Another three nights of Michael Portillo at 7.30pm started with his Great Continental Railway Journey from Batumi To Baku, which did 252,000. Last week’s episode ranked #2 for the channel behind only Who Do You Think You Are? A repeat of Clean Eating: The Dirty Truth then did 206,000.